Class of the SkeletonDeformation layer. References synfig::Layer_MeshTransform::max_texture_scale, SET_INTERPOLATION_DEFAULTS, synfig::ValueBase::set_list_of(), and SET_STATIC_DEFAULTS. 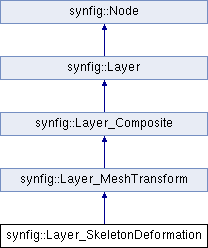 References synfig::ValueBase::can_get(), synfig::Mesh::clear(), synfig::Bone::distance_to_shape_center_percent(), synfig::ValueBase::get(), synfig::ValueBase::get_list(), synfig::Matrix::get_transformed(), synfig::Matrix::invert(), synfig::Layer_MeshTransform::mesh, synfig::Bone::Shape::p0, synfig::Bone::Shape::p1, synfig::Bone::Shape::r0, synfig::Bone::Shape::r1, synfig::Mesh::triangles, synfig::Layer_MeshTransform::update_mesh_and_mask(), and synfig::Mesh::vertices.